SkyTest® supports FTOs to prep their students for pre-hiring screenings at major airlines with dedicated aptitude training media. Our professional solutions include student software licenses, classroom workstation software licenses, online instructor administration and performance measurement tools. Our client-server-based training infrastructure is the cutting-edge solution to prepare your classes for upcoming airline screenings. Supply your students with the latest training tools installed on the workstations of your company or even directly on their notebooks and tablets. 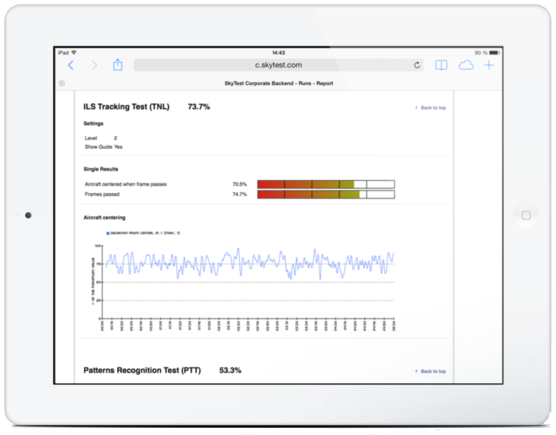 With the browser-based SkyTest® interface for tutors you monitor your students’ performances in real-time and have a sound basis to recognize individual weaknesses to give targeted training advice – independent from your students‘ current locations. Add career value to your classes! SkyTest® Classroom Solution has a lot of advantages your organization will benefit from. It complements your existing training courses with accurate aptitude analysis and improvement to prepare your students for upcoming pilot selections soundly – an important step in today‘s aviation career environment. We will be glad introduce the benefits of SkyTest® Classroom Solutito your organization. 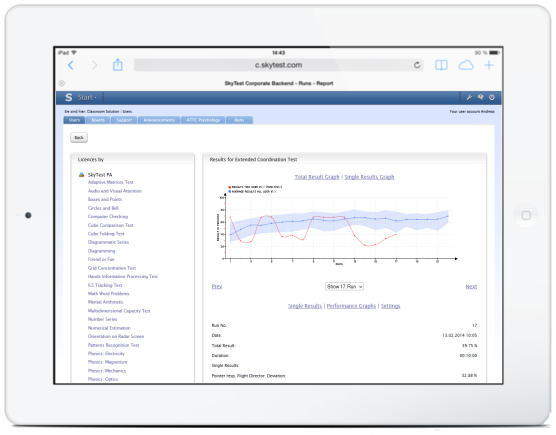 Please contact our sales team at office@skytest.com for free demo access. SkyTest® desktop and tablet products can simulate screening test runs with their Classroom mode. In this mode, students have to work on default tests at a stretch – just like in actual screening. All tests can be set up either with the easy, medium and difficult level specified by SkyTest® or with parameters adjusted by your own. In SkyTest® Classroom Solution backend there are comprehensive reports generated on grounds of the performance of each student, to provide an overview of current strengths and weaknesses. This is a reliable source for further training advices to improve future performance development.